25th anniversary contest: Caption this! You are at:Home»Stories»25th anniversary contest: Caption this! After 25 years of entertaining Navy Times readers with Broadside, Jeff Bacon wants you to do his job for once. 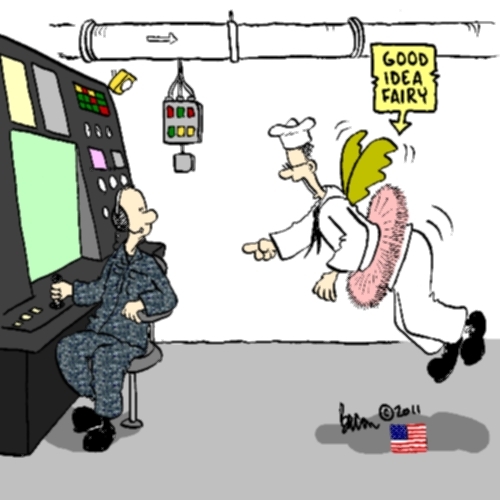 The creator of the winning caption for the above “Good Idea Fairy” cartoon will gain immortality as a “Broadside”-style caricature. The Bacon-rendered portrait of the lucky author will appear in a future issue of Navy Times, along with the winning caption. To enter, leave a comment. Please include your full name, rate, rating or rank, e-mail address and phone number. Enter by 5 p.m. Eastern on March 28. Good luck, and be funny. Sure…you can make it a target 1 wire. The LSO’s will appreciate the increased boarding rate! Behind every good idea fairy is a Master Chief to give you the correct idea.